Instrument P.I. : Mike Taylor, Utah State University, Logan, UT. Technique: Slit-less spectroscopy using an InGaAs detector array. Scientific objective: Detect shock emissions in the range 0.96 - 1.67 micron and measure blackbody continuum in the near-Infrared where the blackbody continuum peaks at lower temperatures. Instrument: The instrument consists of an InGaAs camera with a 600 l/mm objective grating. 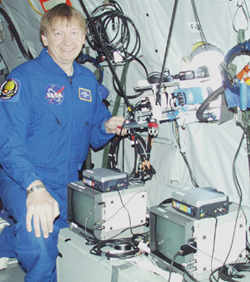 Heritage: This camera was deployed during the 2002 Leonid MAC mission when it detected the first meteor spectrum in the 0.96-1.67 micron range. Instrument validation tests: This camera has been used in past missions. Sensitivity: The InGaAs camera detects stars of about J-magnitude +2, meteors of about magnitude -1. The co-aligned intensified camera detects stars of magnitude +6. Dynamic range: 8-bit (factor 256). Video signal is recorded in NTSC (680x480 pixels). Frame rate and exposure times: Exposure time: 1/30s per frame or 1/60s per field (interlaced). In first order: 5.6 nm. 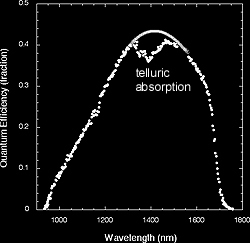 The spectral range is 960 - 1670 nm.